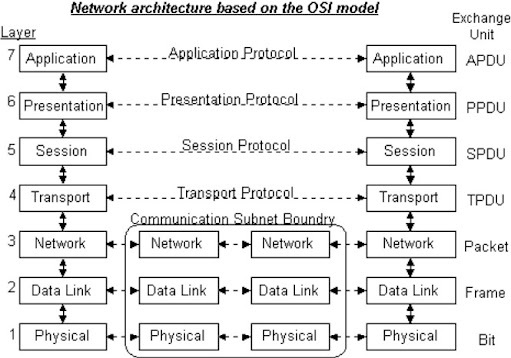 The International Standards Organization created a network model called the Open Systems Interconnection(OSI Network Model), which allows diverse systems to communicate. The seven-layer OSI network model provides guidelines for the development of universally compatible networking protocols. The physical, data link, and network layers in a network model are the network support layers. The session, presentation, and application layers in a network model are the user support layers. The transport layer in a network model links the network support layers and the user support layers. The physical layer in a network model coordinates the functions required to transmit a bit stream over a physical medium. The data link layer in a network model is responsible for delivering data units from one station to the next without errors. The network layer in a network model is responsible for the source-to-destination delivery of a packet across multiple network links. The transport layer in a network model is responsible for the process-to-process delivery of the entire message. The session layer in a network model establishes, maintains, and synchronizes the interactions between communicating devices. The presentation layer in a network model ensures interoperability between communicating devices through transformation of data into a mutually agreed upon format. The application layer in a network model enables the users to access the network. TCP/IP network model is a five-layer hierarchical protocol suite developed before the OSI network model. The TCP/IP network model application layer is equivalent to the combined session, presentation, and application layers of the OSI network model. Four levels of addresses are used in an internet following the TCP/IP protocols: physical (link) addresses, logical (IP) addresses, port addresses, and specific addresses. The IP address uniquely defines a host on the Internet in a network model. The port address identifies a process on a host in a network model. A specific address is a user-friendly address. Copyright © 2009 The-Network Model housebrooks. All Rights Reserved.